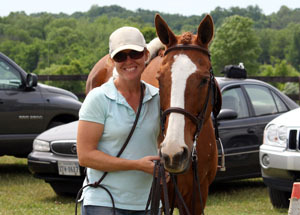 Our riding instructor, Meredith Schwenke Jones, has been teaching since 1995 at Criswood Farm in Woodbridge, Va., before moving to Culpeper to establish Touch Point Farm. She also has had teaching and camp experience from her years as a counselor at Bayberry Riding Center in Spotsylvania, Va. and as a riding program supervisor and instructor at Mulford Day School in Centerville. 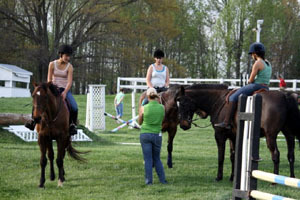 Meredith takes her students to Hunter Shows, Dressage Shows, and Combined Training Events. She also coaches our A.I.R.C. Riding Team. As a freshman at the College of William and Mary, she was selected for the Intercollegiate Riding team, and was named captain in her Sophomore, Junior and Senior years. During these years, she was also employed as a teaching assistant in the college riding program. Currently, she enjoys showing her own horses in Dressage and Combined Training Events. She is a member of VHSA.